Have you read your tire lately? 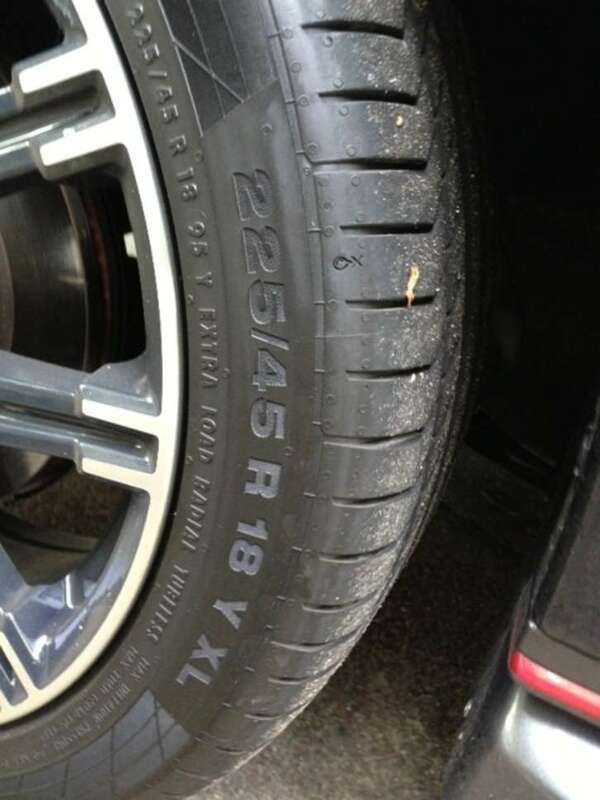 Perhaps a more accurate question to ask would be this one: do you know how to decipher the codes located on the sidewall of your vehicle’s tires? For many people, that question is answered in the negative. Tire codes may be a mystery, serving as an interpretation best left to the people that install them. Tire codes can be deciphered by anyone, information that can come in handy the next time you shop for new tires. We will use the example photograph to break it all down and explain what these codes mean. There is a lot of information printed on your tires. That information has been standardized per federal law, which requires tire manufacturers to provide uniform coding. The coding appears on two separate rows that wrap around the outside wall of the tire. The first or outer row has a larger alphanumeric layout than the second, inner row. The coding may be in white for easier reading, but that isn’t a requirement. Pictured: Continental ContiSport Contact 225/45 R 18 Y XL tire. The example tire is a Continental ContiSport Contact 225/45 R 18 Y XL. Continental is the name of the tire brand or manufacturer; ContiSport Contact represents the model name. Some tires lead off with a letter “P” before the alphanumeric sequence, with “P” representing a passenger tire. Or, it may begin with an “LT” for light truck tires. The “225” represents the nominal width of the tire in millimeters. That number converts to 8.85827 inches. The number “45” after the backslash is known as the aspect ratio, representing the ratio of height to width. It is followed by an “R” to tell you that you are looking at radial tires. The “18” is the rim diameter code, representing 18-inch tires. The letter “Y” is for the tire’s speed rating. This rating ranges from Q to Y, covering speed maximums of 99 to 186 mph. The example tire earns the highest rating because it is a summer tire, also known as a performance tire. The final two letters will read either LL, SL or XL, describing light load, standard load and extra load tires respectively. If no letters are present, then you have standard load tires. The load factor is important as the type of tires used can impact your vehicle’s load weight including its payload. It’s a tire safety issue that consumers should keep in mind. Much of the information found in the first row is repeated in the second row. With the example tire, there is also a number found, 95, that does not appear on the first row. That number represents a tire’s load index or how much weight each tire can hold. The higher the number, the more weight that each tire can support. You need to view a load index chart to determine the precise tire weight limit. In this example, the “95” represents 1,521 pounds. Immediately after the “extra load radial tubeless” imprint is information about maximum air pressure. That number notes the air pressure maximum you can safely add before the tire is susceptible to damage. However, it is not the number you should use when maintaining your tires. Instead, that information can be found in your owner’s manual as well as on a placard typically located on the inside of the driver door jamb. Information not seen on the example tire is its traction, temperature and treadwear ratings. The higher up in the alphabet the letter, the better the rating for the first two ratings. For the last rating, a higher number indicates how well your tires will perform against the industry standard. That means a “100” rating will match that standard, while a rating of 80 means your tires will have only 80 percent of the industry standard’s tread life. Are you overwhelmed yet? It is easy to feel that way, especially when you need to shop for new tires. You can avoid consternation by simply asking your tire retailer to match your new tires with the ones that you already have on your vehicle. Your retailer has access to a database that lists the right size tire for your car and can discuss your options when considering various alternatives. Federal law has made tire coding mandatory, but what is not so easy to accomplish is deciphering that information. Review your owner’s manual to find the right replacement tires for your car.